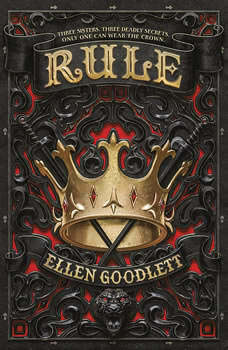 Three Dark Crowns meets Pretty Little Liars in this sensational and striking new fantasy from debut author Ellen Goodlett. Three girls. Three deadly secrets. Only one can wear the crown.The king is dying, his heir has just been murdered, and rebellion brews in the east. But the kingdom of Kolonya and the outer Reaches has one last option before it descends into leaderless chaos. Or rather, three unexpected options.Zofi has spent her entire life trekking through the outer Reaches with her band of Travelers. She would do anything to protect the band, her family. But no one can ever find out how far she's already gone.Akeylah was raised in the Eastern Reach, surrounded by whispers of rebellion and abused by her father. Desperate to escape, she makes a decision that threatens the whole kingdom.Ren grew up in Kolonya, serving as a lady's maid and scheming her way out of the servants' chambers. But one such plot could get her hung for treason if anyone ever discovers what she's done.When the king summons the girls, they arrive expecting arrest or even execution. Instead they learn the truth: they are his illegitimate daughters, and one must become his new heir. But someone in Kolonya knows their secrets, and that someone will stop at nothing to keep the sisters from their destiny... to rule. Magic, mystery, and blackmail abound in the first book of this sensational and striking fantasy duology.